The descent into Hong Kong’s Kai Tak airport was everything I expected and more. 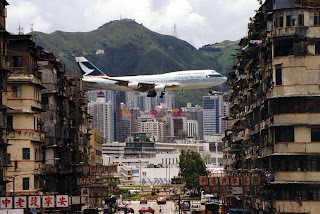 Exciting, exhilarating and downright terrifying, I swear the plane’s wings trawled laundry hanging to dry outside the Kowloon buildings as we banked a sharp right in our descent. I could actually see the early morning cartoons small children were watching as they wolfed down congee for breakfast before school. Someone at the back of the cabin screamed, and I remember feeling the tell tale signs of two size elevens being pushed into the back of my seat as the man behind me tried to steady himself against the fear we were going to crash. Of course we didn’t. Despite being one of the most challenging approaches in aviation history, Kai Tak actually had very few crashes, and less than an hour later I walked out of the airport, unbeknownst to me about to embark on a new life 7,500 miles away from my home in Newcastle, England. It was 15 November 1995, and the time was approximately 6am. Just fourteen hours earlier I had boarded a plane in Heathrow, dreaming of seeing the world and living the life of a traveller. Having worked for a hire car company in Jersey to raise some money, my plan was to spend two weeks in Hong Kong before working in Australia for a year and then travelling on to Fiji, Los Angeles, and eventually New York. That was the plan anyway. Following advice from the guidebook I had firmly clutched in my hand, I took a bus to the Star Ferry terminal and boarded a boat. Jetlagged, sleepy and nervous, I slowly rubbed the sleep from my eyes and Victoria Harbour’s spectacular skyline appeared before me for the first time. I was in love. It was no use. England paled into distant memories and I knew that I would never leave Asia again. This is an excerpt from a chapter I wrote for a book called Many Ships One Boat. While the book actually explores the human and humorous side of expat life in Singapore, my own personal contribution starts with my arrival in Hong Kong and winds up in the Lion City via a brief stint on a tropical beach in the Philippines. 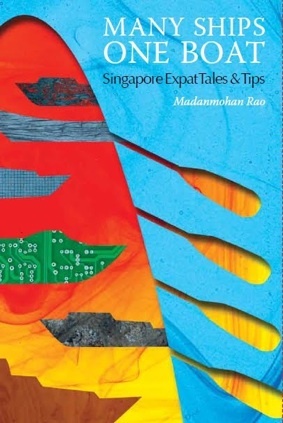 Available from Select Books, Many Ships One Boat features the delightfully different narratives of 20 expatriates living in Singapore today, and is a rollicking good read. Copyright © In Search of Gerard Butler All Rights Reserved. Picture Window theme. Theme images by konradlew. Powered by Blogger. In Search of Gerard Butler by Portia De Jorday is licensed under a Creative Commons Attribution-NonCommercial-NoDerivs 3.0 Unported License. Based on a work at insearchofgerardbutler.blogspot.com.